In building any structure, fire rated safety products will be required by code. This is necessary to contain any fires from spreading and burning out of control. Not too long ago, these codes were not as strict, and before that, they did not even exist. Due to many devastating fires over the years, smartly these laws came into effect. Below are some important fire safety products for proper air flow and containment of smoke and fire. There are many different types of fire safety products that serve different purposes. 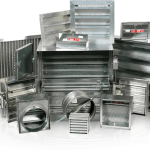 Fire dampers are an ingenious invention in that they will stop the spread of a fire in the ductwork of a building. They are a simple but effective fire safety product. They will close shut when the temperature reaches around 165 degrees Fahrenheit thus stopping the flames from spreading through the ductwork. Access doors provide access to areas in a building or home that needs maintenance from time to time. If there is a possibility of a fire that the access door gives access to, then it is always recommended to get a fire rated access door. This fire safety product will contain a fire before it has a chance to get out of control. A back draft damper helps prevent fires. This fire safety product helps circulation in areas where there may be flammable fumes. They are designed to prevent reverse air flow thus keeping air flowing through a space. They are also used to eliminate dangerous non-flammable fumes in manufacturing facilities. A ceiling radiation damper is designed to channel airflow out of a UL rated fire resistive floor/ceiling. This fire safety product will close automatically in the event of a fire to slow down or stop its spreading. 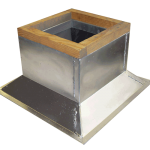 A ceiling radiation damper can also be installed boots and register boxes. Smoke dampers are installed in air conditioning and ventilation ductwork of a structure to prevent smoke from spreading. 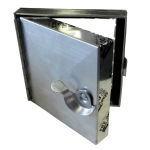 Combination fire smoke dampers add the benefit of a fire damper to a smoke damper for the ultimate in fire safety. A smoke damper can be triggered automatically by an alarm system such as a smoke detector.